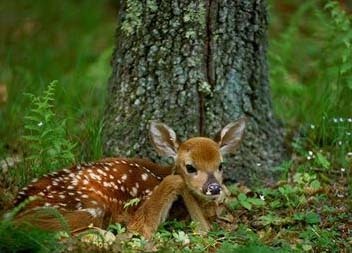 An SCP-728 fawn in the Sector-28 habitat. Special Containment Procedures: Upper Level 36 of Sector-28 has been converted into a habitat for the resident 728 herd, with observation points built into “cliffs” constructed of harvested stone from local blasting operations. An artificial stream runs the length of the Level, with grating on either side to prevent injury, and a filtration system installed to allow the water to be recirculated. Grass, trees, and other foliage native to the natural environment of SCP-728 has also been introduced, and is to be tended to by Upper Level Botanical Engineers. While the enclosure is open to all personnel with level 1 Security Clearance, anyone wishing to enter must be outfitted with a helmet and shock-absorbing torso protection, in the event of an airborne buck becoming aggressive. The first is the ability to rotate the shoulder joints, so as to extend all four legs perpendicular to the body. This enables use of the second, which is to unfurl the normally hidden patagium (an extension of skin with adjustable tautness) for flight, in much the same way as the common flying squirrel. The third is a significantly lowered bone density, which seems to have been developed to allow for prolonged gliding. While at rest, the patagium is not visible, and the shoulder joints appear no different to those of the average whitetail. Therefore, it is of the utmost importance that the escape of any member of SCP-728 be prevented, and development of the herd be monitored closely for change. The captive herd currently numbers 27; 9 male, 18 female. The Cape herd numbers approximately 60, with an unknown male:female ratio. SCP-728 was discovered in Rocky Harbour, Newfoundland, by the first operator of its (now historic) lighthouse. The duty of keeping the herd secret had been passed down through generations of successive lighthouse keepers, until late 2008, when a Parks Canada employee detailed its existence to the local media. Two teams were dispatched shortly afterward: one to suppress the story and relocate and/or terminate all individuals involved, and another to retrieve several members of the herd for breeding and experimentation, and to replace the Parks Canada officials involved in the upkeep of the lighthouse.